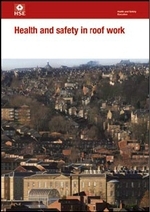 Working safely on roofs will show on screen for download and we will email you a copy. Working on roofs is a high-risk activity because it involves working at height. Roofers make up nearly a quarter of all workers killed in falls from height at work. Falls through fragile materials, such as roof lights and asbestos cement roofing sheets, account for more of these deaths than any other single cause. Not all those who are killed while working on roofs are trained roofers: many people accessing roofs are maintenance workers. There are also many serious injuries, often resulting in permanent disabilities.